Peale shared a Philadelphia studio with her husband and exhibited her art at the prestigious Pennsylvania Academy of the Fine Art from the 1840s through the 1860s. In 1848, Harriet Cany Peale exhibited Peasant Girl and Fancy Portrait at the Pennsylvania Academy of the Fine Arts for the first time. Greatly admired as a portrait and still-life painter, with Kaaterskill Clove Peale illustrated that she was also a masterful landscapist as well. She also collaborated with Rembrandt on replicas of his famous porthole portrait of George Washington. Clarke (1808-1896) was born into the New England generation that would bring about changes in every aspect of American life. In 1816, the Clarke family moved to Boston where Sarah’s interest in painting began to develop. Her family marveled at her talent. This is the only painting by Sarah Freeman Clarke online. After her father’s death in 1830, Sarah and her mother set up a boarding house in Boston. The venture lasted only a few years but during that time Sarah met future reformers, poets, artists and authors, including the Peabody sisters. 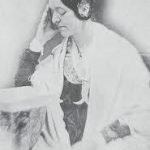 Elizabeth Peabody introduced the concept of Kindergarten in the United States. Her sister Sophia Hawthorne married author Nathaniel Hawthorne and sister Mary married educational reformer Horace Mann. Both men and all of the sisters would become Sarah’s life-long friends. After closing the boarding house, Sarah moved to Newton, Massachusetts. Through her friends from the boarding house and her brother James Freeman Clarke who was attending Harvard, Sarah met a wide variety of future reformers. 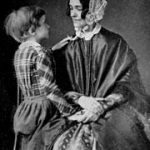 Her friendships included poets Oliver Wendell Holmes and Ralph Waldo Emerson, artist Washington Allston, feminist Margaret Fuller, educator Bronson Alcott, and future President Benjamin Pierce. Despite her connections, Clarke rarely asserted herself, and she repeatedly sacrificed her own interests to care for ailing family members. Her new friends encouraged Clarke to pursue her artistic talents. Washington Allston, a famous Romantic landscape painter in her circle of friends, accepted Clarke as a pupil, and she produced numerous sketches and paintings for various publications and her artwork was shown at the Boston Athenaeum. Clark was brilliant and multi-talented; she finally emerged as one of the first professional artists of the nineteenth century. Few nineteenth-century women dared to approach art as a profession. Sarah Clarke was an exception. Her formal art career began slowly as she wrestled with decisions concerning her future and periods of self-doubt. 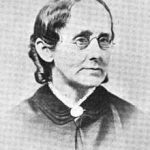 … Bronson Alcott and Horace Mann beckoned for her to fulfill the need for participants in educational reform. … Often, feelings of frustration resulted from her inability to capture the creative inspirations, which seemed to drift fleetingly in and out of her daily activities. While family still came first for Sarah, the young woman was uncertain as to which direction the intellectual part of her life should take. 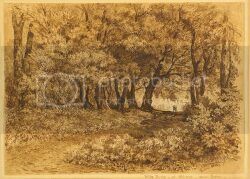 Born in New Haven, Connecticut, Elizabeth Gilbert Jerome (1824-1910) created still-lifes, portraits and landscapes. As with most women artists, According to Harry Willard French’s Art and Artists in Connecticut (1879), Jerome’s family forbade her to enter the field of art. Her stepmother destroyed her drawings when she was fifteen. At the age of 27 she finally began studying drawing and painting. As most art academies did not accept women, she studied with history painter Julius Busch in Hartford and portraitist Emanuel Leutze in New York City. This painting is a testament to the creative will in an era when women were actively discouraged from pursuing careers in the arts. 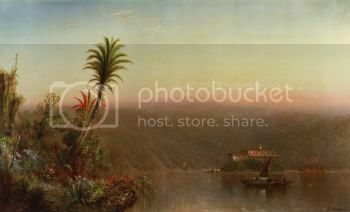 It has been suggested that Jerome was influenced by landscape artist Frederic Church due to the similarities in their South American landscape paintings, like this one. Jerome transcended the typical role of women. After marrying Benjamin Jerome in 1856, she moved to Hartford, Connecticut, where she lived for many years. They had two daughters before they separated in 1887, when Jerome moved back to her family home in New Haven. She exhibited at the National Academy and at the Pennsylvania Academy of the Fine Arts, and became a well-known portrait artist in Hartford during the 1860s and 1870s. Jerome stopped painting after the death of one of her daughters. However, in 1904 at the age of eighty, she returned to the easel and began painting miniatures, which were very popular at the time. She created an impressive body of miniature paintings, which she continued to create until her death on April 22, 1910. She was eighty-six. Florida’s most important nineteenth-century woman artist, Laura Woodward (1834-1926) was Florida’s most important nineteenth-century woman artist and one of its greatest publicists. She was born March 18, 1834 in Orange County, New York, and by the early 1870s she was a professional artist living in New York City. 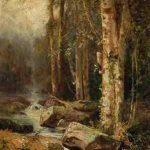 She traveled to rustic and unsettled locations to paint – in the Catskills, Adirondacks, White Mountains and Green Mountains. 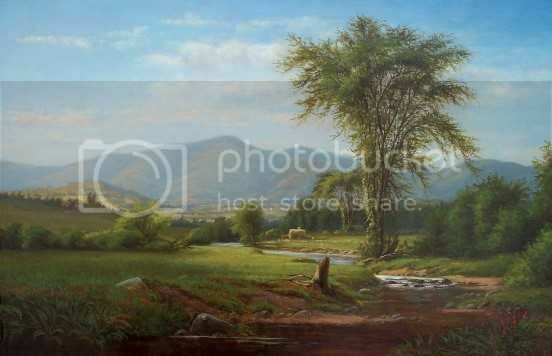 She also captured on canvas the beauty of the coasts of Maine and Massachusetts coasts; and the landscapes of New Jersey, Pennsylvania and Connecticut. Woodward exhibited her work at the the Pennsylvania Academy of the Fine Arts, American Art Gallery, the Centennial Exhibition of 1876, and numerous expositions in the South and Midwest. She received glowing reviews in the New York Times, the Brooklyn Eagle and several art publications, and her paintings sometimes commanded higher prices than those of her male colleagues. Woodward was in her fifties when she first came to St. Augustine on Florida’s Atlantic coast in the mid-1880s. The climate there was not as tropical as she had hoped. 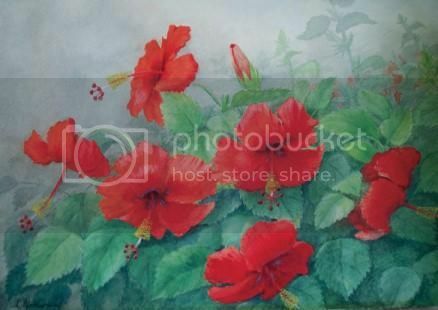 Therefore, she traveled throughout Florida searching for exotic plants and flowers to paint. She heard that a certain area farther south was just what she was looking for; she made the arduous trip south and discovered the tropical foliage she craved in what was then called Lake Worth. By 1889 Woodward had established a temporary home there, while painting outside in what was then mostly a jungle inhabited by panthers, alligators, and bears. Woodward brought her watercolor sketches of the Lake Worth area back to St. Augustine and joined a group of artists at Henry Flagler’s Ponce de Leon Hotel. There she became famous for her renderings of the Royal Poinciana tree and its blossoms. She told Flagler that the Lake Worth area should be developed as a resort, using her paintings as evidence of the beauty of the place. Flagler was compelled by her art and bought property in the locations depicted in her paintings. In 1894 Flagler built the Hotel Royal Poinciana on the shores of Lake Worth in Palm Beach, and it soon became the largest resort in the world. Flagler provided a permanent home and studio to Woodward in his new hotel. His newspapers credited Woodward for publicizing the allure of Florida’s east coast nationwide. She often visited New York and other locations in Florida, but Woodward made Palm Beach her home for the next thirty-three years. Laura Woodward explored other areas in Florida, including what is now Miami and its environs. There, she painted Seminole Indians and sketched the Everglades – although it was dangerous there. She became nationally known for her delicate portrayals of unspoiled nature throughout Florida, and they were well-received by the public in Florida and New York, and were purchased by art collectors. The Palm Beach Art League was founded in 1920, and its members acknowledged Woodward as a pioneer and elected her as an honorary member. Due to failing eyesight, by 1920 Woodward was unable to paint, but remained highly regarded as the pioneer artist of Palm Beach. In 1926, at the age of 92, she moved to St. Cloud where her caregivers lived. She died May 9, 1926. In 1940 the Palm Beach Art League held a memorial exhibition for Laura Woodward. Woodward was inducted into the Florida Artists Hall of Fame in 2013. Florida’s most important Nineteenth Century woman artist, and one of the earliest and greatest publicists of our state’s image as a “tropical paradise,” Laura Woodward changed the course of history in Florida by influencing Henry Flagler’s choice of resort location with her ideas and naturalistic paintings of the Palm Beach area. She enlivened awareness about Florida before the time of color photography by exhibiting her works widely, thus enticing tourism to the state. 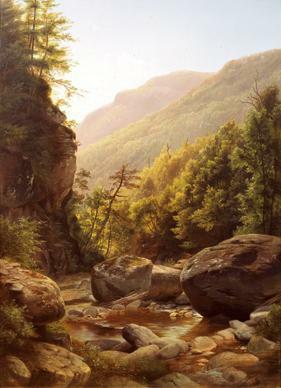 Prior to moving to Florida, Ms. Woodward was an acclaimed Hudson River School Artist and among the most distinguished of American women artists painting at that time. She was also one of the first professional artists to paint natural images in the wild areas of the Everglades. Her important role in the development of the state is now taught in history classes at Florida colleges. Laura Woodward’s inspired dedication to the Florida landscape, and her legacy as a tireless advocate for women artists in this country, survive her.